Anxiety is a very persistent master; when it moves into families, it takes over daily routines, schoolwork, bedtime, and recreation. Join us to learn strategies for breaking the worry cycle so we can raise courageous and independent children and improve the emotional functioning of our families. Licensed clinical social worker and psychotherapist Lynn Lyons will discuss concrete strategies that parents and educators can use with children and teens to handle current anxiety and also to prevent the development of anxiety and depression later in life. We’re planning book talks at local schools leading up to the event on April 1. More information forthcoming, but please mark your calendars! 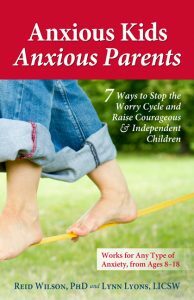 Lynn is the co-author with Reid Wilson of Anxious Kids, Anxious Parents: 7 Ways to Stop the Worry Cycle and Raise Courageous and Independent Children and the companion book Playing with Anxiety: Casey’s Guide for Teens and Kids. She presents internationally to mental health and medical providers, educators, school nurses, and parents. She is regularly featured on television and public radio, including Katie Couric and Morning Edition. Books and DVDs will be available for purchase.